Ultrasound imaging utilizes high frequency sound pressure waves to detect and map anatomical structures within the body. The frequencies of the waves, generally between 2 and 18 MHz, are too high to be detected by the human ear. During an exam, ultrasound waves are generated by a piezoelectric transducer and focused into an arc by either a lens or the shape of the transducer itself. Phased arrays are used in more modern machines to adjust the depth of focus and the direction of the beam. 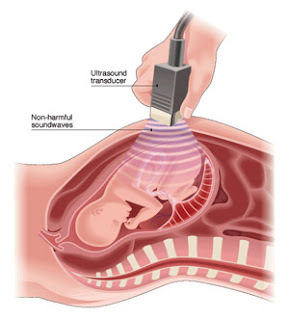 When the transducer is positioned correctly, the sound wave is directed into the body, with its focal point at the organ or structure that is being imaged. Ultrasound is a powerful technology that is particularly suitable for imaging the borders between solid tissue and fluid-filled spaces. It enables operators to adjust their activity in real time in order to generate the most informative image and has no dangerous side effects. Ultrasound units are portable and inexpensive, making them easy to deploy throughout hospitals and clinics. Drawbacks of ultrasound include the inability of sound pulses to penetrate bone and its poor performance in imaging organs that are surrounded by gas. Because ultrasound imaging requires skilled technicians, it is highly dependent on the availability of these technicians. Most ultrasound probes integrate a large number of pulse-generating transducers. A gel is applied to the skin before the probe is placed to enhance sound wave transmission. As sound waves travel into and through the body, the degree to which they are reflected changes each time they reach tissue whose density differs from the tissue previously encountered, with larger differentials resulting in larger echoes. The reflected sound waves cause vibration in the transducer, which are then transformed into electrical impulses. The image element associated with each impulse is a function of the time from sound wave emission to reception; the focal length, which is associated with tissue depth; and the strength of the echo. Ultrasound imaging is used diagnostically to detect lesions or pathology, as well as to assess fetal health. The types of ultrasound range from A-mode, which uses a single transducer to scan a line through the body to M-mode, in which a quick succession of A- or B-mode images form a video that reflects the movement and velocity of organs and tissues.